I'll get back to reviewing more of the VTT market shortly. At the moment the damn iPad is occupying way to much of my time. The main use it is seeing, besides surfing the web and emails, is reading my gaming material. There are different apps that allow it, each has its own quirks. iAnnotate PDF - let me start by saying it is a bit buggy right now, as importing PDFs is more then a PITA. However, for those that you do import, you can highlight, underline, mark up, pin notes, bookmark - it is simply an amazing tool to use when you are going thru a PDF and want to make it yours. Needs the ability to erase your changes, which I haven't found yet. Pricey at $6.99, but will be priceless when they work the bugs out and refine it. Amazing what it can do right now. 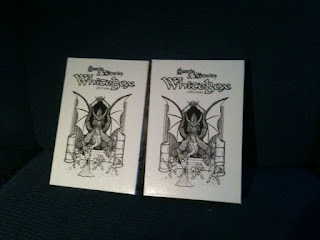 My Swords & Wizardry White Boxes! I have my Swords & Wizardry White Boxes, and they are good! Only one came with the adventure and map insert, but that's okay, as the extra box will be a giveaway at the next "Gathering of Fools", tentatively scheduled for some time in June (its when my old gaming group gets together a couple of times a year). I plan to have them do a last man standing with some pre-made PCs... winner gets the box, losers will get the Swords & Wizardry Quickstarts. Okie, I'm just damn excited. Going to touch the pages a few more times. I know the main campaign I'll be running with Fantasy Grounds will be using the Labyrinth Lord rules and the AEC supplement. Yep, on my weekend getaway I made a purchase at RPGNOW / DriveThruRPPG. Nothing new there, I tend to pick up PDFs there on a nearly weekly basis. I need to find time to read them... heh. It wasn't the purchase of OUBLIETTE Issue 2 that makes me label myself as crazy. The first issue was a good one and I have no reason to expect anything less from the second issue. This purchase probably marks me as somewhat sane. Haven't done more then glance at it yet. No, the purchase that marks be as loopy, crazy, jumped into the deep end of the pool is Legends of Anglerre. I'm a big fan of the FATE system even tho I've yet to use it in game. Spirit of the Century, Starblazer Adventures (nice, loose sci-fi rules), Dresden Files... its a great system for storytelling. Legends of Anglerre makes the FATE system accessible to us Fantasy roleplayers. And it looks good so far. I say so far because its a huge friggin book. The damn iPad is getting a workout. Now all I want to do is read ALL of my FATE powered RPGs and see what I can steal from each. There is not enough free time for me to do so. And it is really driving me loopy. It's not like I can read the stuff at my desk at work... or I could, but the results won't be pretty, work-wise.